It’s the little things. 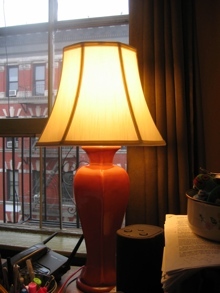 I’ve taken a picture of my lamp to show off my new lampshade. The previous one was a mess and I managed to find a new one that is a much prettier shape, and provides more delicate lighting and color. My new lampshade will sustain me during my marathon writing session today. I’m going to get a ton of editing and writing done today. That is the plan. Here’s my to-do list. Wish me luck. – I will not look at kittens and puppies on Petfinder. Update: It’s too freaking hot out. And I have been checking Cute Overload periodically, but getting some work done. Finney medicine given and he doesn’t hate me yet. He forgets seconds later, thank God.